All I can say about this stuff is it’s DEADLY, SINFUL, CRAZY GOOD. You might want to go run a couple miles after you eat this stuff. Funny story: I made this yesterday and put it down in my cold storage room for the chocolate to set. I brought it upstairs last night, filled a dish and set it out for a party I had at my house. This morning I couldn’t stop thinking about it the whole time I was at the gym. I told my friend about it and was so excited knowing I still had half a cookie sheet of this yumminess tucked away safely in my cold storage room. I got my boys off to school and got myself ready for the day. As I was heading out the door to my son’s elementary school, I took a detour to the basement to get the cookie sheet so I could fill a bag of it to take to my friend, and of course, so I could eat some and gain back all those calories I burned at the gym. I flipped the light on and looked right in the spot where I had left it last night and IT WAS GONE! I knew in a second where I would find it. I walked into the family room and there it was, the cookie sheet, completely empty. I wanted to cry. I wanted to strangle my son. I wanted to cry some more. Yep, that definitely put a damper on my day! In 2-cup microwaveable measuring cup, microwave brown sugar, butter and corn syrup uncovered on high for 1 minute, stir and cook for 1 more minute. Stir in baking soda until dissolved. Pour caramel mixture over cereal, stirring until evenly coated. Microwave on high for 3 minutes, stirring every minute. Spread on cookie sheet. Cool 10 minutes. Break into bite-sized pieces. In a small microwaveable bowl, microwave unwrapped caramels and cream on high for 1 minute. Stir until smooth (you may have to microwave it for a little longer, do it in 15 second increments). Use a spoon or fork to drizzle over Chex mixture. Repeat with milk chocolate baking chips and again with the white baking chips. 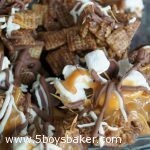 Quickly sprinkle coarse salt over all the chex mixture while candy drizzles are still wet. Not all stores carry the Chocolate Chex. I finally found mine at Target. Naughty, Naughty, Naughty GOODNESS is all I have to say! Thanks for this recipe! I think I will love this! i’m a chocoholic… and this seems like it would do the job! You will love it!! Thanks for looking! FOUND U THRU REESES-LOVE UR BLOG AND WHAT HANDSOME BOYS U HAVE. 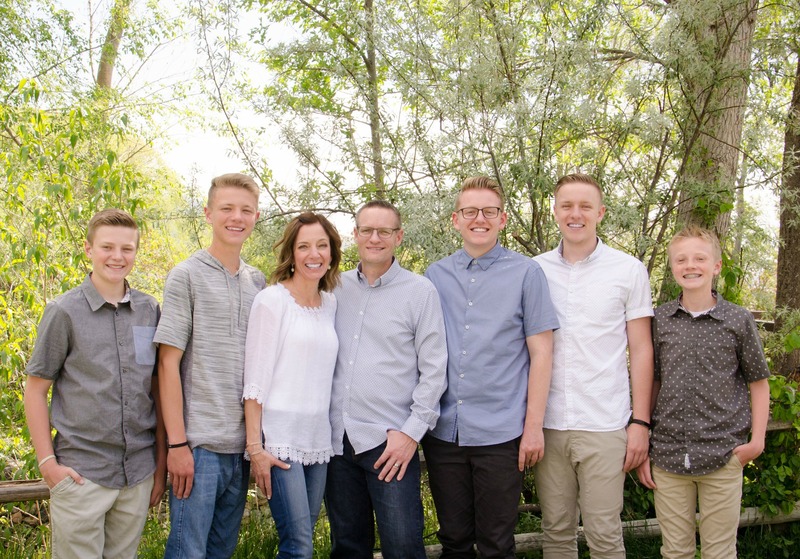 I AM A MOMMY TO 2 BOYS-CAN’T IMAGINE 5! WOW!!! Made this today for my daughters bday treat at youth group. YUMMMMY!!! thank you!! We used half corn and half rice chexs and my daughter added 1/2 cup of red and green m&ms and the kids LOVED it! Great idea to make it that way for the holidays!